Virgin Steele has been taking a softer and less epic tack with each album since their run of excellent releases in the 90s, to the point that The Black Light Bacchanalia was close to unrecognizable as a Virgin Steele album. For anyone who hoped for a resurgence of their former power, I've got some bad news: Nocturnes of Hellfire & Damnation takes this trend further, and with an almost unlistenable vocal performance. In the promo sheet I got, I have a note from DeFeis stating that he feels like this would have been the followup to Noble Savage if he had had the chance back in the 80s to follow his more artistic inclinations and hadn't had to appease "some of the other 'factions'...who wanted some kind of a 'hit'". Tonight I'll say a prayer of thanks for those factions and this contribution of theirs to the spectacular post-Noble Savage back catalog, because Nocturnes of Hellfire & Damnation is pretty awful. This starts out a lot like The Black Light Bacchanalia, but goes further in that direction -- especially with regard to the strange and distracting vocal performance. Listening to Lucifer's Hammer, the first track, I almost did something I never do, which was stop right there and blow off the whole album. DeFeis's vocals are all over the place, and his vocal range, once clearly the sound of a talented human voice, is here the product of enough autotune to raise the eyebrows of a hip-hop singer, in between too-breathy vocals alternating with his trademark squawked growls. Sure, Virgin Steele is no stranger to a bombastic presentation, but the vocal effects are distracting and cringe-worthy, and the production shoves them in the listener's face. Edward Pursino's guitar work, on the first few tracks, is still quite good, with some heavy riffing here and there, and if DeFeis would shut up even for one brief moment, I'm sure I could appreciate it better; as it is, any available instrumental space is gobbled up by wordless vocalizations. Here and there we get a flash of their old sound; Black Sun-Black Mass, while it doesn't equal their past hits by any means, at least has vestiges of the fierce authority of past epic tracks on its verses and chorus. Persephone, too, if one ignores all the "ooh"s and "ohh yeah"s as the song starts, is also quite decent, though a touch too theatrical for my taste; its galloping guitar rhythm fits with the keyboard, and even the high-pitched vocals work here whenever DeFeis is concentrating on the song. The problem is, you can't ignore the wordless vocals; the production makes that impossible by highlighting them at the expense of the music, which isn't particularly amazing melodically in the first place. One can barely listen to fairly simple, meat-and-potatoes rock tracks like Demolition Queen or We Disappear -- the former with an incongruously doomy verse riff that would normally be rather interesting --, because DeFeis is already yowling "look at me, look at me!" at the front of the mix. The lyrics are just as confused as the vocals, and the breathy, too-lengthy musings of the softer portions of the last couple of tracks, broken up by stock late-80s power chords, aren't exactly a saving grace of the album -- though I did like Fallen Angels a bit more than most of the other tracks. It's not by any means a rousing song, but the slow, pensive melody fits in with the vocal style since DeFeis manages to rein himself in more on this song than on faster, heavier songs. Black Sun-Black Mass saves Nocturnes of Hellfire & Damnation from a Crap of the Month rating -- barely, not by much. This bomb can be compared to Queensryche's Dedicated to Chaos: An embarrassing production from a once-classic band that's lost its way, led by a singer who apparently has followed his muse to a place where he is no longer interested in heavy metal, singing well, or even making comprehensible music. 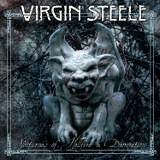 If you're a Virgin Steele fan who simply has to have every album produced under the name, even you should think twice about getting this one.